[Arena Title] : in the range of 4 to 140 characters. [Start Time] : set the time to the battle start in the range of 3 minutes to 24 hours as “Entry period”. Arena is a duel that players can hold and operate. Beta version is available free of charge. As it is a beta version, there is a possibility to change the contents and stop publishing. All players can create a duel tournament (arena). The number of participants is 2 to 12 people. It is an automatic battle similar to the Land Battle “Knight battle”. You can not create more than one arena at the same time. 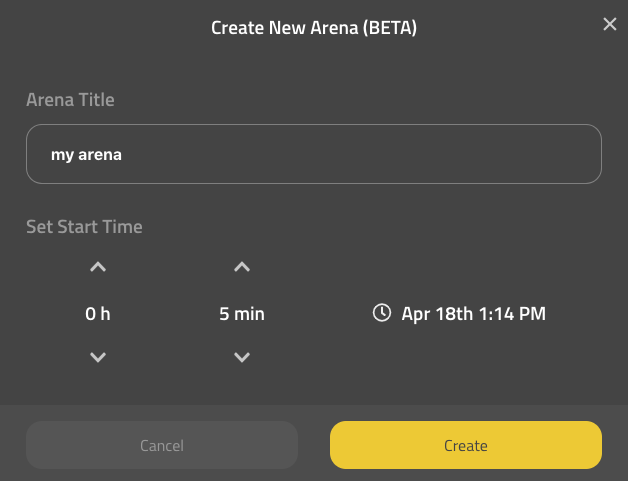 The player who created the arena (Host) will see an automatically generated password for each arena. The host gives the password to other players and invites them. You can choose to join or not join your arena. You can join the arena by entering the password given by the host on the arena screen. If the corresponding arena is “Entry period”, you can enter. You can cancel it after entry. You need to edit the team for the arena. There is no limitation of heroes and extensions to be teamed. You can edit the arena team at any time. Arena teams are not affected by Cryptid (NIE, EMA). There is no limit on the number of times you can entry arenas, but you can not enter more than one arena at the same time. When the “Battle Start” time comes, an automatic battle is executed. The “Attack” and “Defence” in each battle are set randomly. Basically, the ranking rules follow the rules of “knight battle”. The arena results will be displayed immediately after the “Battle Start”. After that, anyone can view it without the password. *The content of announcement is subject to change.